Children 6 years old and below sharing room with at least 1 adult stay for free, and shall be extended complimentary kids’ meals, tours and boat transfers. Rates are inclusive of 3 full board meals, tours and boat transfers. For Lagen Island – Children 7-11 years old shall be charged Child Supplement of PhP 2,900.00 ++ per child per night, inclusive of breakfast, use of snorkeling and kayak at resort and boat transfers. For Pangulasian Island – Children 7 – 11 years old shall be charged Child Supplement of PhP 3,500++ per child per night, inclusive of breakfast, use of snorkeling and kayak at resort and boat transfers. Children 12 years old and above shall be charged applicable adult rates. Should a separate room be requested for children below 12 without any adult sharing the room, one child shall be charged the single adult rate. The number of children sharing room shall depend on the maximum capacity per room type. This is applicable to all resorts. No guests below eighteen (18) years old will be allowed to book any room in or stay at El Nido Resorts unless accompanied by an adult. A guest’s age is established upon booking and is subject to confirmation on the first date of resort stay. Guests may directly book their flights via Airswift (former ITI). The resort is independent and shall not be held responsible for Airswift’s policies on airfares, schedules, and flight operations. Transfers to the resort shall only be via El Nido Resorts boats. Guests arriving via their own boats are not allowed to enter the property for security reasons. Charges shall be applied to those who are unable to check-in as scheduled, including forfeiture, for failure to comply with this procedure. Standard check-in time is 3:00PM (Apulit, Miniloc, Lagen) and 3PM for Pangulasian Island. Standard check-out time is 12NN. Late check-out may be requested from the Front Office, subject to availability. No refund shall be made in the event of no show or shortened stay. All visitors to the El Nido-Taytay protected area, 12 years old and above, are required pay a conservation fee of PhP 200.00 per person per visit. This fee is collected for various conservation projects and may be settled at the resort upon check-out. In case of acts of God, fortuitous events, or any condition beyond our control, El Nido Resorts or our carriers shall not be held responsible for failure to deliver services, nor be obligated to provide additional services. Delays and/or cancellations of flights and/or boat transfers resulting from or related to weather disturbances or as mandated by Government authorities are beyond the control of El Nido Resorts. El Nido Resorts or our carriers will not be responsible for unused rooms or missed flights and no refund will be given on account of these events. Flying of drones of/above any of El Nido Resorts properties is not permitted by any individual whether employee or guests, non-resort tourist or local hobbyist. Exceptions will have to be with prior signed documented permission granted by Ten Knots Development Corporation Makati Office/Management Committee. In the event that a drone crashed in any El Nido Resort property or activity areas, the drone will be reported and turned over to El Nido/Taytay Police for their disposition. Please be advised that rates are inclusive of travel insurance for guests 7 to 65 years old. Optional insurance is available for guests 6 years and below. All visitors to El Nido, 12 years old and above are required to pay an Environmental Fee of PhP 200.00 per person for the duration of stay. This fee is collected by the Municipality of El Nido for various conservation projects, and may be settled at the resorts upon check-out. 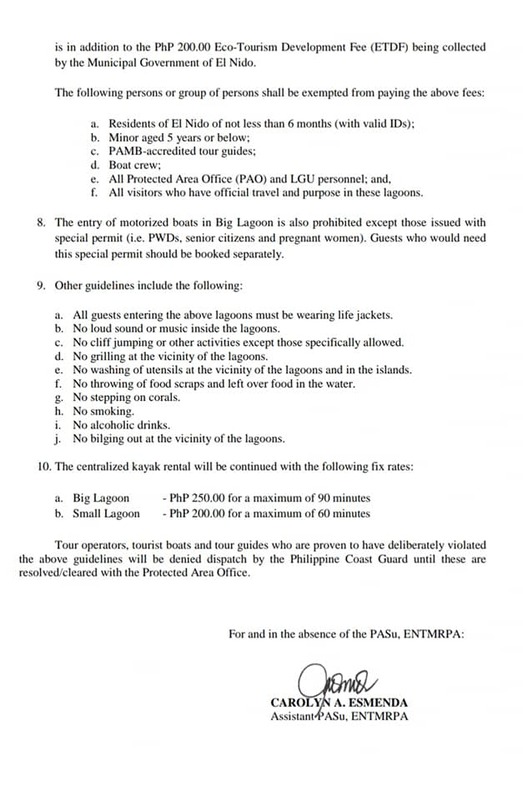 All visitors to the Big and/or Small Lagoons 6 years old and above, are required to pay a fee of Php 200.00 per person, per lagoon visit in line with the efforts of the Protected Area Office (PAO) of El Nido-Taytay. The funds collected will be utilized solely for the conservation and management activities of the islands in Bacuit Bay & the protected areas involved, and may be settled at the resorts upon check-out. 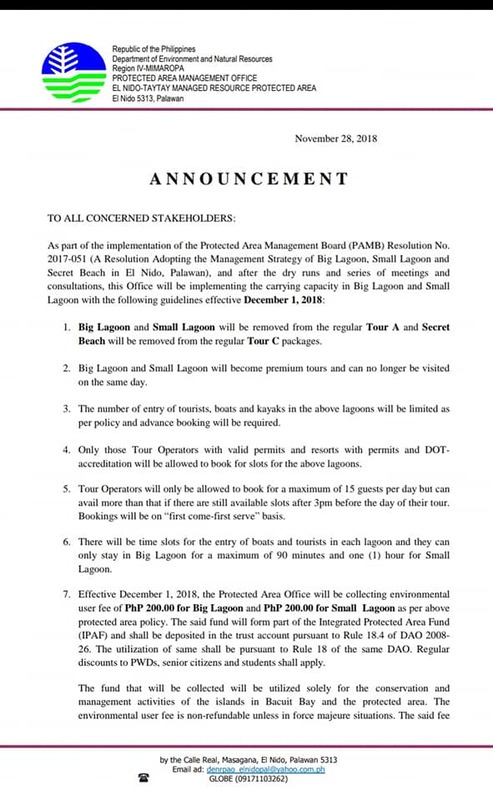 To know more about Protected Area Management Office’s announcement, view the official letter here.